Christian Theological Seminary (CTS) will award honorary degrees to two of the nation’s most influential faith and social justice advocates during commencement exercises on Saturday, May 20. Rev. 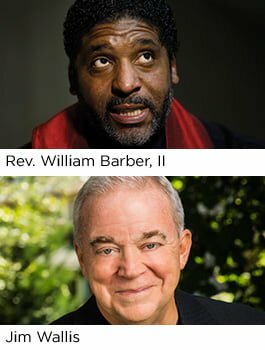 Dr. William Barber, II, President of the North Carolina NAACP, pastor at Greenleaf Church and founder of the “Moral Monday” movement; and Jim Wallis, president and founder of Sojourners, will receive Doctor of Divinity degrees from the ecumenical seminary based in Indianapolis. Rev. Dr. Barber, II previously preached and lectured at CTS in 2016 when he headlined the Seminary’s Black History Month activities. He will address the CTS Class of 2017 graduates during commencement exercises on May 20. The author of several books exploring morality, politics and social justice topics, Rev. Dr. Barber, II has pastored Greenleaf Christian Church for 25 years and headlined “The Revival: Time for a Moral Revolution of Values” a national organizing tour in 2016. He is a frequently sought expert on political advocacy issues addressing race, poverty, injustice and inequality. Rev. Dr. Barber’s father was a CTS alumnus. The commencement exercises will be preceded by a baccalaureate service on Friday, May 19. The program will include remarks delivered by Jim Wallis, president and founder of Sojourners, a non-profit faith-based organization, network, and movement whose mission statement calls for “putting faith into action for social justice”. The baccalaureate address at 7 pm will be held in Sweeney Chapel and is open to the public. A bestselling author, theologian, national preacher, social activist and thought leader on ethics and public life, Wallis teaches at Georgetown University and has taught at Harvard University. He is a widely sought commentator, and also chaired the Global Agenda Council on Values of the World Economic Forum. “The issues driving conversations in the Christian Church, America and the world today are diverse, complex and often contentious. We look forward to the insights that Rev. Dr. Barber and Jim Wallis will share with the next generation of pastoral leaders as they graduate and enter their calling in the world at large,” said Dr. Gunning Francis.